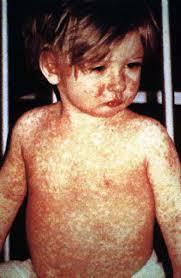 A child showing a classic fourth-day measles rash. Measles can cause a rash, fever, and upper respiratory illness. It is highly contagious. Complications can include pneumonia, encephalitis and even death. The Michigan Department of Community Health is urging parents in Michigan to have their children vaccinated against the measles, after five unvaccinated children came down with the highly communicable disease. "Measles can result in complications that include hospitalization, pneumonia, encephalitis and in severe cases, death," says spokeswoman Jennifer Smith. "So it isn't something to be taken lightly." The first two cases happened in children who traveled to the Philipines, where measles is still common. They infected two other unvaccinated children when they returned to Traverse City. The measles vaccine is highly effective in preventing the illness, but cases have been increasing in the U.S., in part because some parents fear vaccines can cause autism. Those fears persist despite an overwhelming body of scientific studies debunking any such link.